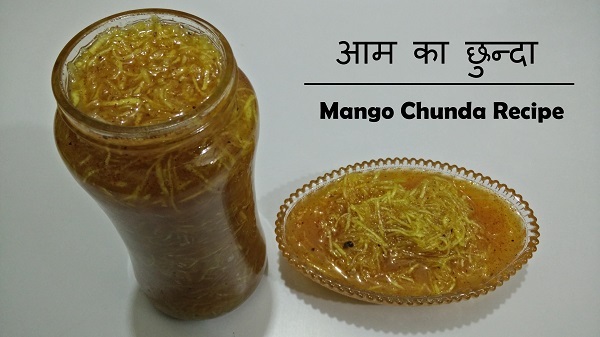 Traditionally Aam ka Chunda / Mango Pickle is made by keeping the raw mango & sugar mixture in direct sunlight. The intense sunlight of the hot Indian summer cooks this mixture and within 4-5 days the Chunda is ready. In Gujarati families, Thepla and Chundo are a famous combination, that even children enjoy this pickle due to its sweet and sour taste. You can also make it instantly by cooking on the Gas stove or in Microwave but the taste can’t be matched with traditionally made Chunda. Grate or shred the raw Mangoes. In a large pan, add raw mango and Sugar. Add Powder sugar so that it will get dissolved easily. Once the sugar is dissolved, stir for more 5 – 10 minutes. Keep it aside for 2 hours so that sugar will get dissolved in it properly. After 2 hours, add Turmeric Powder and Salt, mix well. Cover with a transparent cloth and keep in direct sunlight 4 – 6 hours a day for 4 to 5 days. Stir once before and after keeping it in sunlight. After 5 days, check sugar consistency of 1 string. Add Cinnamon Powder, Clove Powder and Red Chilli Powder, mix well. Do not make a fine powder of Cinnamon & Clove, grind it coarsely. You can also add Kashmiri Chilli Powder instead of Red Chilli powder. Again cover with a transparent cloth and keep in direct sunlight for 4 – 6 hours. Chunda / Pickle is ready. Store in an airtight container. It can be stored up to 12 months.